I do love recycling. 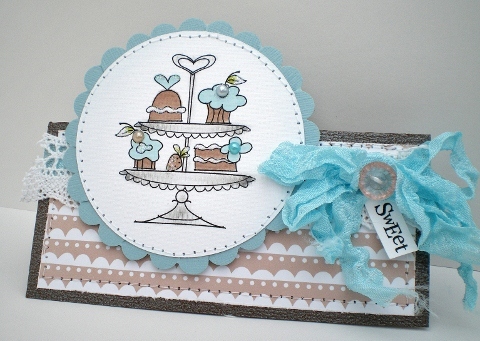 I've recycled the image from this card I received from Liz at Pink Petticoat, I love how it's printed onto handmade paper. 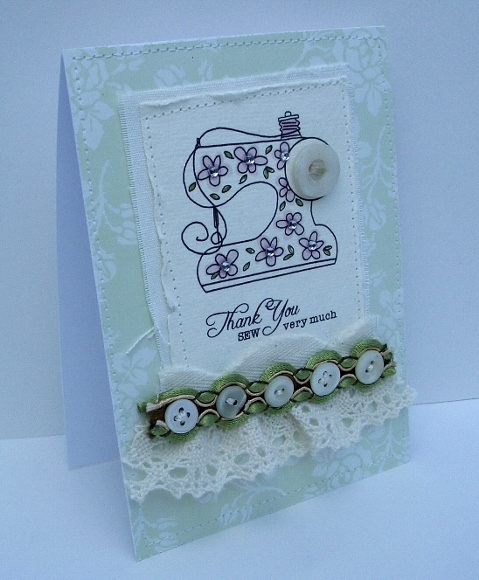 I was having a bit of a clearout but couldn't bear to part with the card so thought I'd recycle the image panel. 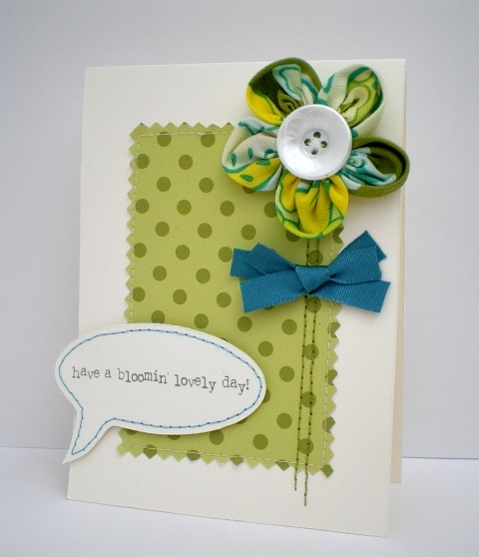 It's Wednesday, so time to join in with WOYWW over at Julia's Stamping Ground. 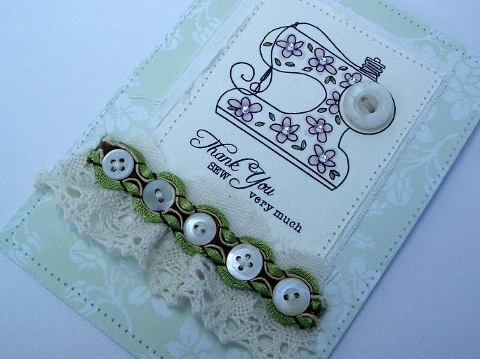 On my workdesk this week; I've the makings of a 'Hope You Feel Better Soon' card and a crafty bargain. 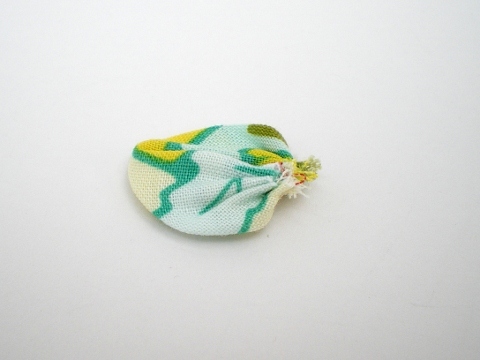 Don't you just love crafty bargains. I checked out the new Poundland store that's opened by my local supermarket and found these notebooks, 6 for £1. Next time you see them they'll be looking a lot prettier! Thanks for stopping by. Made this card just for fun, no challenge or DT project. 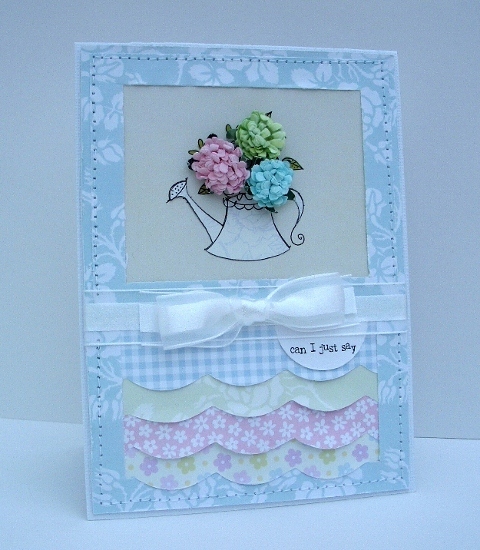 It's another card made using paper scraps, though not such a tall order to match colours as they're all from Pink Petticoat so use the same colour palette. 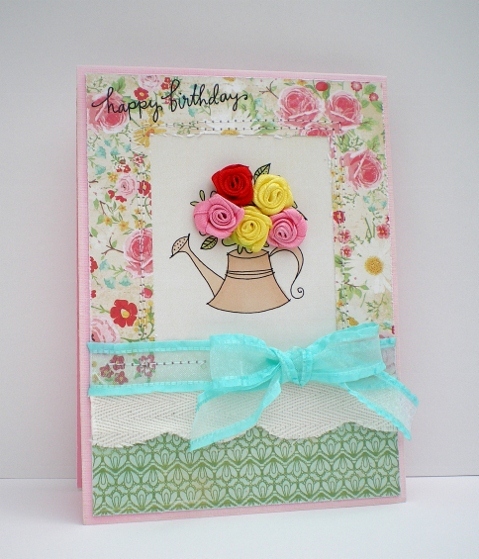 Silly me only just realised the relevance of the sentiment to this watering 'can' image. I'm sure you all got it straight away. Who needs expensive dies, I cut the scallop edges with the Fiskars ShapeCutter and template. 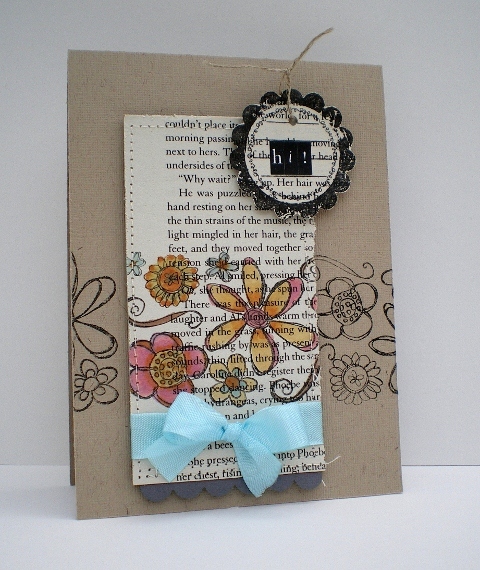 Here's my first Fiskarettes DT project and it's featured on the blog today, how exciting! 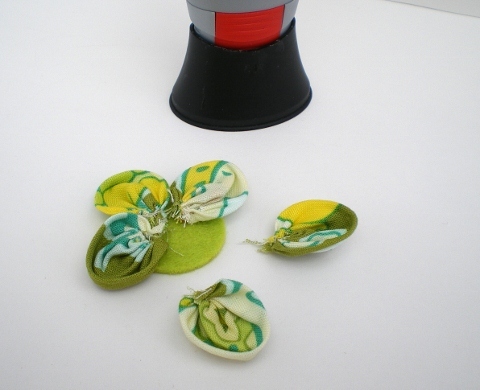 Pop over for the supplies list and step-by-step instructions. It's well worth a visit, lots of inspring projects, some familiar faces and the Friday Freebie. Time again to show off our Workdesks over at Julia's Stamping Ground. Here's my crafting space, not a lot going on today. 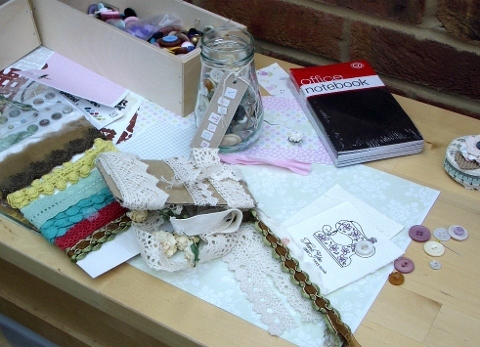 A box of cards waiting for envelopes and inserts, a fabric flower to finish making into a brooch, a crafty to do list as long as your arm and the wooden chest still to alter. I've had comments over the weeks at how tidy my desk is. 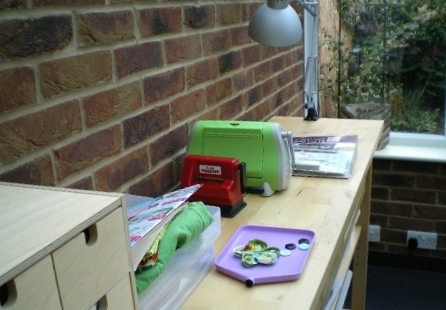 My craft bench is in the conservatory, lovely for the natural light but not such a good idea in the height of Summer, everything has to be packed away otherwise the sun will fade it. I'm off now to book tickets for the Knitting and Stitching Show, that'll be one thing off the to do list. Happy Wednesday! 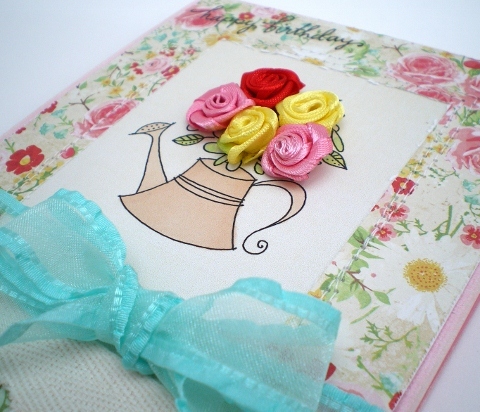 I consider myself very lucky to have been asked to join the Ribbon Girls as Guest Designer for July, they're a very talented team of crafters and I'm a huge fan of The Ribbon Girl products. 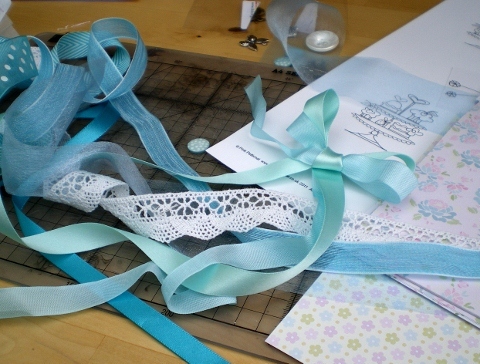 The Colour Challenge this month is Shades of Aqua and I was sent a lovely stash of goodies to play with to create my card. 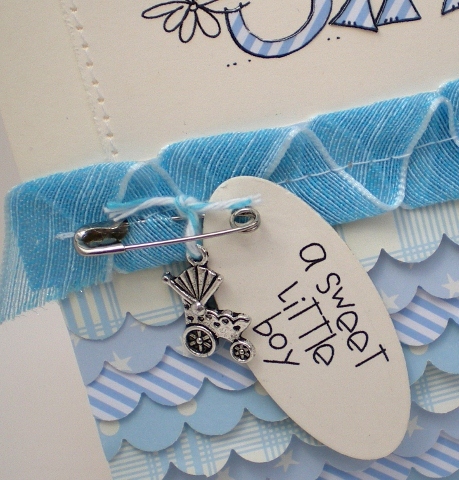 I just had to use this baby buggy charm, isn't it the cutest, and I'd always wanted to make a pair of Mary Jane baby shoes, I got the template from Splitcoast Stampers. 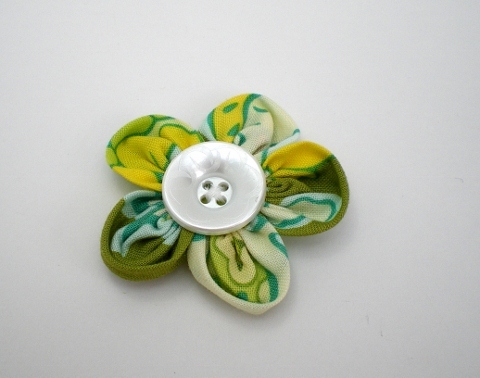 Please check out the Ribbon Girls blog and join in the fun. 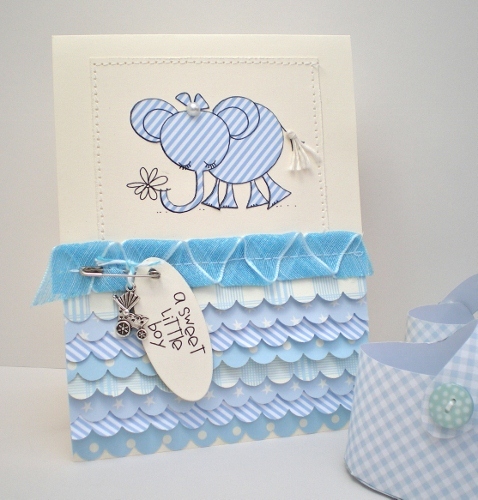 You have until July 31st to enter and all you need to do is create a new card/project using shades of aqua. 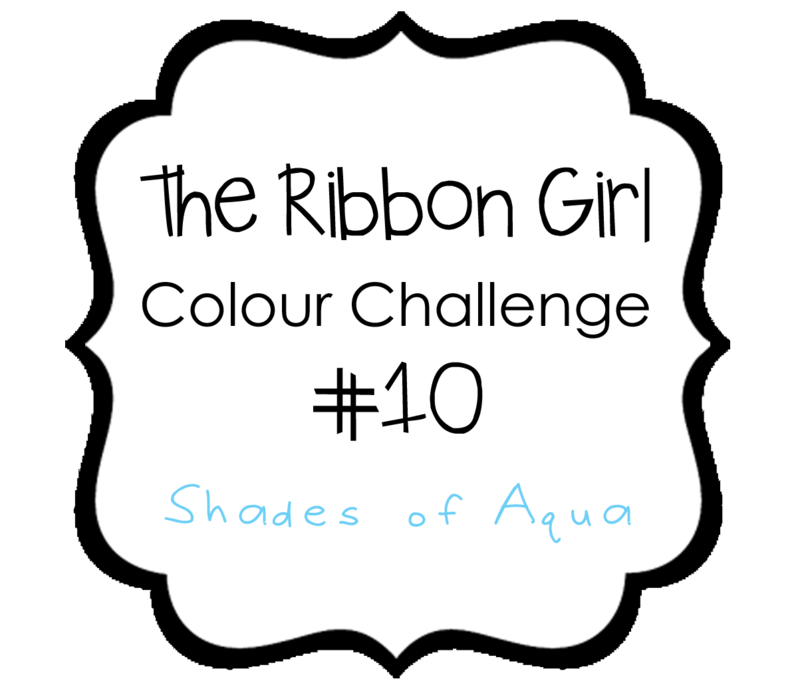 There's two prizes up for grabs, check out the Ribbon Girls blog for all the details. 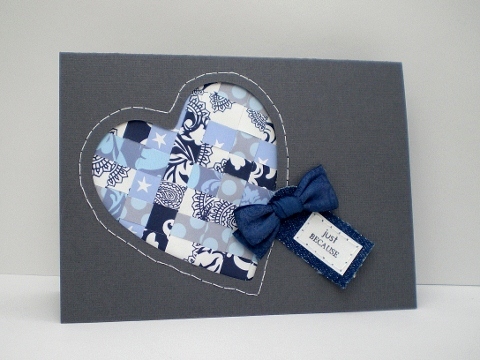 This week is my Guest Designer spot over at Card Patterns. It's a particularly lovely sketch this week . I don't usually make this size/shape card so it was an opport﻿unity to try something different and I had a ball. So thanks ladies for choosing me as your Guest Designer this week. 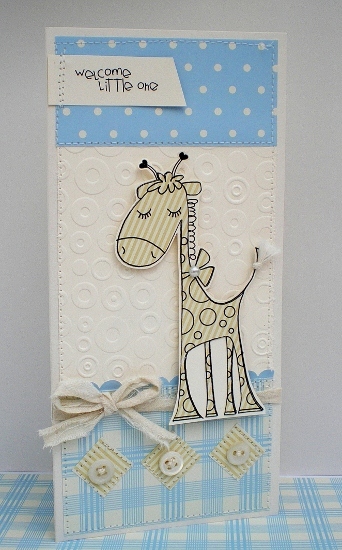 Be sure to hop over to the Card Patterns blog to see the Design Team's fabulous work. My favourite kind of card. I've been disciplining myself lately to use up my paper and ribbon scraps. It's really quite satisfying although the restriction can mean it takes a little longer to come up with a design! 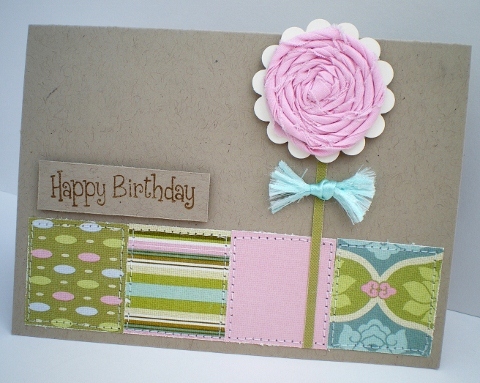 Both the pink bias binding and the papers on this card are from my scraps box. I did have to use one 'new' element. 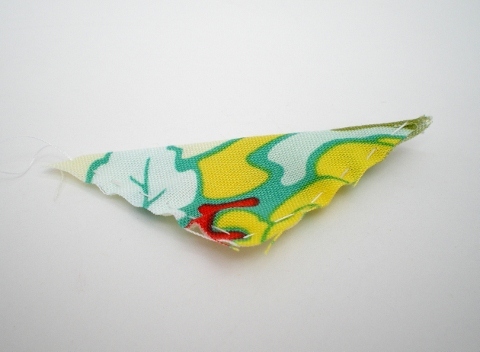 The aqua satin ribbon from The Ribbon Girl that I've cut and frayed to make the leaves, it was the perfect colour match. A card from almost nothing, makes me happy! 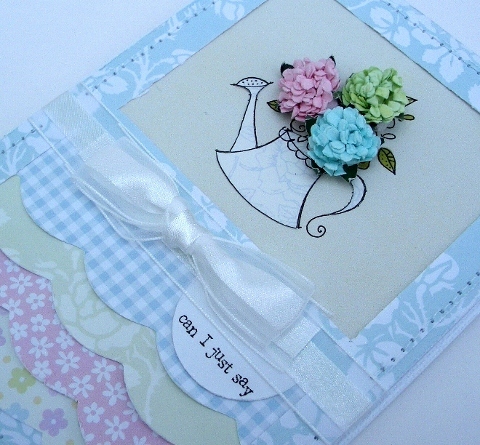 For the layout I've used sketch 123 over at Card Patterns. I'm beginning to sound like a broken record but I can't believe another week has gone by! 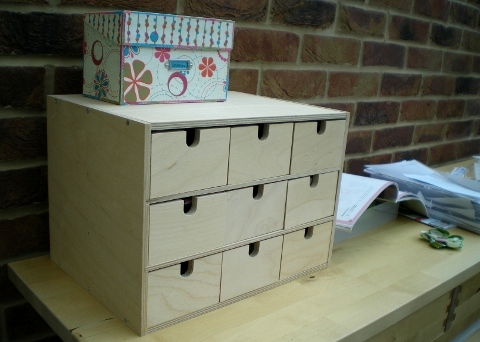 It's Wednesday which means it's time to share your wordesk over at Julia's Stamping Ground. Well it's a busy one for me today. Three cards to make before Friday and today is my only window of opportunity. I don't know about you but when I have a deadline the ideas seem to dry up. So then I just cover the desk with papers and ribbons and hope for the best!. If I get a move on and get the cards finished my next project is to alter this wooden chest. I didn't manage to get 'round to everyone last week, hoping to make up for it this week. 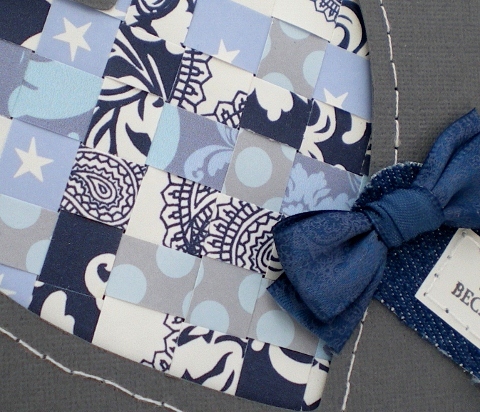 I've been wanting to try some paper weaving ever since I saw this challenge over on the Create blog. The weaving was easy, it was harder to decide which patterns and colours would work together. I decided on a grey/blue colour palette for a 'manly' look. Rummaged through my Pink Petticoat scrap box, cut various patterned papers into 1cm wide strips and played around until it looked right, another great scap buster! For the tag I die cut some denim! 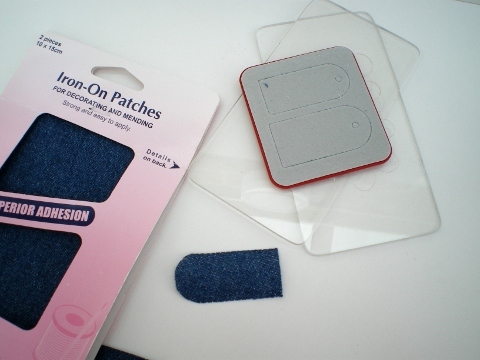 I find these iron-on patches work really well in a die cutting machine because they have a heat seal backing that makes them easier to cut than regular denim. Another week gone by and it's Wednesday, time to share our workdesks over at Julia's Stamping Ground. DT positions are a bit like buses, nothing for ages and then 3 come along. That's how it's been for me anyway, nothing for 5 months and now 3 offers. 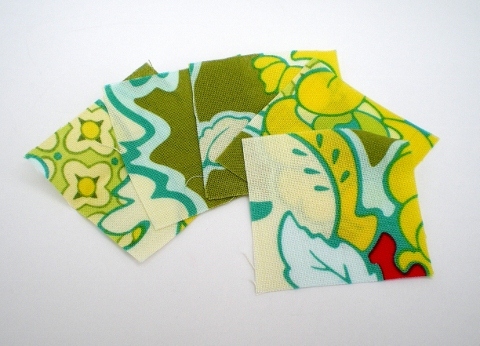 The first one being a place on the Fiskarettes Summer Design Team. I love Fiskars products so I'm really excited about the next three months, I get to play with some fun new products, create tutorials and share them on the Fiskarettes blog. I'm going to enjoy the Summer! 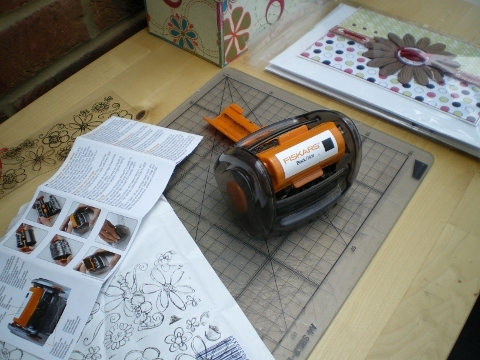 So that's what's on my workdesk today my first Fiskars product I'm playing with the Continuous Stamp Wheel, really easy and fun to use, I'll be sharing the projects I make with it in the next few weeks. Off now to to have a nosey. 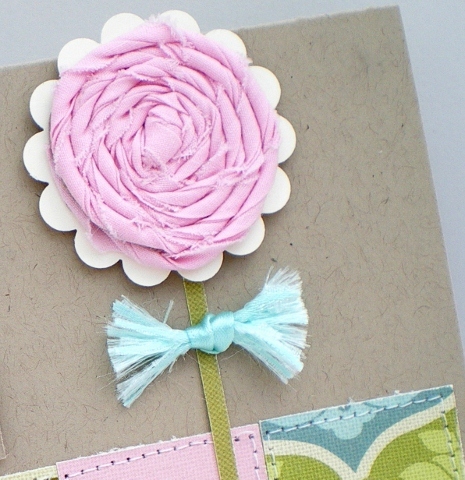 Now here's the card I made with the fabric flower - see last post for how-to-make. There's a little secret to this card, it's a gift card. Bet you can't geuess what the gift is. Well, you probably can, the fabric flower is now I brooch I just added a brooch back to it and punched a couple of holes in the card front to attach it.